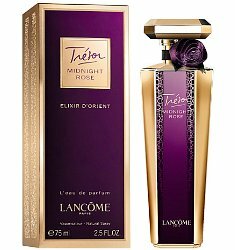 Lancôme has launched Trésor Midnight Rose Elixir D'Orient, a new fragrance for women. Trésor Midnight Rose Elixir D'Orient is a flanker to 2011's Trésor Midnight Rose, which was a flanker to the 1990 version of Trésor. Lancôme's Tresor Midnight Rose Elixir D'Orient is a colourful, upbeat and joyful scent that is sweetly addictive… It embodies mischievous femininity: rose becomes playful, driven by deliciously tangy raspberry tones, wooden shimmers and voluptuous vanilla notes. The notes feature rose, raspberry, vanilla, blackcurrant, jasmine, peony, pink pepper, cedar, patchouli and agarwood. Lancôme Trésor Midnight Rose Elixir D'Orient is available in 75 ml Eau de Parfum. I really enjoy the original Tresor that was created in the 90’s. I used to work at Lord and Taylor and remember spraying it on each day that I worked. I really liked it. This flanker sounds like they are doing too much with it. I just wish perfumers would leave fragrances alone when they have succeeded at creating one. My philosophy has always been, “If it ain’t broke, don’t fix it”. Tresor does not appeal to young people…if they didn’t do flankers, guessing it would end up discontinued. I guess you are right, Robin. But I was in my 20’s in the 90’s. Now that I think about it, my taste in fragrances have always been a bit more sophisticated and refined than my counterparts. And the 30-somethings who want to be the 19-year-olds. Tresor with Oud, it was taking long for this to happen…. Granted I don’t have the most sophisticated snout in the world…am I totally missing the orient in the d’oreint? I had the original flanker (is that an oxymoron?? ), Tresor Midnight Rose, and I liked it when I first got it. But then I guess my tolerance for whatever they used for the cedar note dropped, and it was just so spiky and annoying that I gave it away. I suspect this one won’t be much different on that front, as I’ve encountered that scratchiness with synthetic “agarwood” notes too. But if it’s done in a smoother way, maybe it could be nice.